Incredible shops with beautiful Portuguese products that you *must* visit! One of the most enjoyable ways to discover a new city is to sample its shopping scene, and Lisbon is an especially rewarding place for this type of adventure. For one thing, you can find an astounding mix of historic shop spaces, heritage brands and showplaces of modern design in the Portuguese capital. On top of this, though, is the fact that there really is something for every budget here. Even though Lisbon is enjoying a boom in popularity, and was even designated Best Destination for City Break at the World Travel Awards in 2017, it’s still one of the most affordable European cities. So although you can certainly visit international name-brand shops along the wide, tree-lined Avenida da Liberdade (actually, even for those who don’t plan to do any shopping there, making time for a stroll up this beautiful avenue is an absolute must), if you want to combine shop-til-you-drop retail therapy with a fun way to learn about Portugal’s history of creativity and commerce, all without breaking your budget, there’s no better way than to design yourself a tour of Lisbon’s home-grown retail landscape. Following are some suggestions, in geographical order, that you can use to get your personal tour planning started. Portugal’s history is intertwined with its relationship with the sea, and there is a long and storied history of preserving fish here. In fact, they say that canned fish is one of the healthiest fast foods in the world! And it goes far beyond the famous sardines. You can find everything from mackerel and tuna to octopus and cuttlefish, and the sauces they’re preserved in run the gamut from herbed olive oil to spicy tomato sauce. There are several shops offering a wide variety of the colourfully-packaged delicacies, but one of the most fun is Loja das Conservas (Rua do Arsenal 130), located between Praça do Comércio and Cais do Sodré, near the river. Here you can read about the history of canneries all over Portugal, including some in the Azores. The informative placards about each cannery are in English and Portuguese, so if you’ve been learning this lovely language for some time or even if you’ve just started to learn Portuguese in Portugal, you can check your understanding! And the array of colourful packaging of vintage origin means you can take home a little piece of Portuguese design history, too. Even though there is tea grown in Portuguese territory (in the Azores - the only place in the EU where tea plants are grown), it’s inevitable that much of the tea to be found at A Companhia Portugueza do Chá (Rua Poço dos Negros) comes from afar, including from lands that, in days gone by, were colonies of Portugal. But the history of the tea here is intimately bound up with Portugal’s history as a trading nation, and to understand the sprawling historical footprint of this geographically small country you have to understand its trade. Luckily, you can find no more beautiful “learning environment” than this little shop along the route of the iconic Tram 28 (Rua Poço dos Negros is a part of the city designated by Lonely Planet as “one of the world’s coolest neighbourhoods”). When you peek in from the street, the contrast of red-painted display windows and dark-painted shelves inside the shop recalls exotic lacquer boxes, and the warm, artful lighting invites you into the space. The most popular tea is “Lisbon Breakfast”, a combination of Ceylon tea and Azorean black tea, but there are over 100 varieties on offer, and you can also learn about the best way to prepare them. The manufacture of leather products has a long history in Portugal, and shoes are an important part of this. Some Portuguese brands are internationally very well known, such as Fly London and Luis Onofre (both of which have shops on Avenida da Liberdade), but you might not have heard of Eureka Shoes. This company has been manufacturing shoes for export since 1986, making artisanal products for famous luxury brands, yet only in 2009 launched its own brand, with its first shops in Porto. In 2010 it opened in Lisbon, with two boutique-style shops, in Cais do Sodré (Rua Bernardino Costa 43) and Chiado. There are collections by established Portuguese designers that change throughout the year, offering both cutting-edge styles and classics with a twist for women and men, and the quality-to-price ratio is excellent. For everything from platform sneakers to colour-blocked velvet high-heeled Mary Janes, you’re sure to find something you love. If you walk uphill from Cais do Sodré towards the centre of Chiado, you’ll be almost guaranteed to walk by the gorgeous flagship store of Vista Alegre (Largo do Chiado 20-23), perhaps Portugal’s most world-famous luxury brand. The Vista Alegre porcelain factory was founded in 1824 and combines tradition and modernity in a way that can’t be found anywhere else. The Chiado shop itself, one of the historic spaces of the city, was renovated recently, and the result really resembles a small museum. In addition to porcelain, you can buy crystal, glass, flatware and sculptural pieces, and while it’s possible to buy a whole dinner service (from historical patterns to new designs by Portuguese and international designers including Oscar de la Renta and Christian Lacroix), you can also pick up espresso cup-and-saucer sets from the popular ‘Alma de Lisboa’ collection, with whimsical drawings of the city, from 18 euros. Or if you like 1930’s deco-inspired style, take home the set of four “Cinema Portuguesa” coffee cups by Catarina Pestana. You’ll be taking home a little piece of Portuguese history that you can keep forever. Not far from Vista Alegre is the main Lisbon shop of Burel Factory, Loja da Burel (Rua Serpa Pinto 15B). Burel wool, from a heritage factory in the Serra da Estrela, has a long history of use by shepherds in the region, and the factory in the town of Manteigas uses historic machines and follows a green philosophy. The fabric, made from the wool of Bordaleira sheep, has a natural water resistance as well as insulating qualities and durability. It’s used in everything from capes, jackets and bags to furniture upholstery (if you visit the Casa das Penhas Douradas, high in the mountains above Manteigas, you’ll stay amongst rugs and furniture made with wool from Burel Factory, and if you go for a hike from the hotel, you’ll most likely see a flock of Bordaleira sheep wandering the slopes). In the main Chiado shop, you can pick up blankets, bags, slippers or throw pillows covered with the iconic fabric, or pop down to the nearby home furnishings shop (newly opened - ask for directions; it’s about a three minute walk) to check out upholstered pieces and wall coverings. The company goes to design shows all over the world to work with designers, and you can also order your own custom-made pieces. Next stop is the original Chiado branch of A Vida Portuguesa (Rua Anchieta 11), deservedly famous with - and beloved by - visitors and locals alike. There are now four shops in Lisbon and one in Porto, showcasing a wide array of historic Portuguese brands, many of which were revived in the process of setting up the original shop. The owner of the shops is also the force behind the project to revive the many emblematic kiosks embellishing the parks and squares of Lisbon. In the original shop you enter to see a colourful array of Portuguese wool blankets arrayed behind the cash counter, while to your left is a mini-bookstore with literature about Portugal and Lisbon, and to your right a cornucopia of soaps, fragrances and even toothpaste, all in appealing vintage-designed packaging. You may already be familiar with Claus Porto, and you can find here a wider selection than you may have seen in your home country, but there are many more brands here for you to discover too. Behind the front room are two more spaces, one with goods like vintage notebooks, trendy sneakers and elegantly designed wooden items, the other with products for the kitchen, including edibles such as a variety of olive oils and sea salts and a selection of kitchen implements and utensils. Another Chiado shop, recently opened nearby, focuses on home furnishings; the largest Lisbon shop, at Intendente, has sheets and pillows, glassware, pottery rugs and even clothes, and is housed in the old Viúva Lamego tile factory. If you love to get a T-shirt from every trip you take - or even if you’re not really a ’T-shirt person’ - you’ll get a kick out of Typographia (Rua Augusta 93), which quite possibly has the world’s coolest selection of T-shirts. This shop, located in the heart of historic Baixa (Rua Augusta 93), offers designs by local designers with worldwide collaboration, and the fabric is made and the shirts printed in Porto. The project started in 2010 and the first shop opened in 2013 in Lisbon, but now there are shops in Porto as well as Barcelona and other cities in Spain, and the shirts are sold in museum shops as well. Some of the designs announce with words that they’re about Lisbon (“Lisboa: Cod Eaters Since 1147”), others make oblique reference to hip Lisbon culture (“Vinyl is Not Dead”), while still others simply have a cool, wordless design that only those in the know will recognise. If there’s text, it’s sometimes a mix of Portuguese and other languages, but figuring out what it all means is a fun way, especially as a beginner, to start to learn Portuguese in Portugal. The sizes are unisex, though the XS is small enough for many women, and there are T-shirts in a slightly stiffer 100 percent cotton or a more drapey cotton blend. From here, it’s worth the 10-15 minute walk up to the lower part of Alfama and the gallery-like shop A Arte da Terra (Rua Augusto Rosa 40). This shop offers artisanal craft pieces such as decorative ceramics, traditional textiles, felted wool slippers, tiles, sculpture, jewellery, cork products and paintings. The works presented here combine centuries of tradition with a modern twist, and the shop is housed in the stone-paved, vaulted old stables of the Cathedral, giving it a museum-like feel. In promoting Portuguese arts and crafts, A Arte da Terra has undertaken a series of exhibits over the years, partnering with such institutions as the Barcelos Ceramic Museum, the Bread Museum of Seia, the Calheta Museum in Ilha de S. Jorge (Azores), the Bordallo Pinheiro Ceramic Factory, and the embassies of various EU Member States in Lisbon. It has also partnered with such fado singers as Carlos do Carmo and Katia Guerreiro and designers like Nuno Baltazar and Nuno Gama. Back in Baixa, stop in at a truly emblematic shop, Casa Pereira da Conceição (Rua Augusta 102). It’s one of the shops in the ‘Lojas com Historia’ program, and evokes the way Baixa used to be before it became popular with visitors from all over the world. Just a few decades ago, before shopping malls and megastores, and when Portugal wasn’t so much ‘da moda’ (trendy, popular), Lisboetas and people from surrounding areas used to come to Baixa to do all their shopping. Entering this lovely shop, you might almost imagine yourself back in those simpler times. From the red-and-silver Deco shop sign to the fans (folding, not electric!) and porcelain tea services on display, Casa Pereira da Conceição will transport you to another era. The shop furnishings in the Louis XVI style are set off by vintage industrial coffee grinders and scales, which the shop workers use to custom grind coffee for each customer. In addition to ground coffee (it smells great, but they don’t brew it here), you can buy tea, chocolate, sweets, and a variety of porcelain. If all this walking has made you hungry, stop off for a snack at the Confeitaria Nacional (Praça da Figueira 18B), which, having been founded in 1829, is the oldest pastry shop still operating in Lisbon. Not only that, but it’s still operated by the same family today! Inside you can take a coffee at a counter or sit down in the tearoom upstairs and enjoy any of a variety of treats, such as Bolo Rei (King Cake) from a centuries-old recipe, numerous almond-based cookies, an array of egg-based sweets (doces conventuais or convent sweets, so-called because after starching all their habits with egg whites, the nuns found a delicious use for all those yolks! ), flour- or coconut-based cookies, or chocolates. The light and airy space embellished with gold trim, silvery mirrors and starched white linen, is a lively but relaxing place for a mid-afternoon pause, or you can take home a sweet selection, maybe even including their housemade artisanal jam. To arrive at the top of Principe Real, you can burn off the calories by walking (10-15 minutes, depending how ambitious you’re feeling), or you can catch the Elevador da Glória, one of Lisbon’s iconic funiculars, which will take you from Praça dos Restauradores to the Miradouro (or ‘viewpoint’ - and what a view it is!) de São Pedro de Alcântara. From there it’s only a few minutes’ walk to the Praça do Príncipe Real, arguably the city’s loveliest square. It’s dominated by a giant, trellised ancient cedar tree that provides lots of shade as well as sculptural interest, and there are also two of those vintage kiosks and a little restaurant in the square. The many trees provide lots of escape from the heat in the summer months, but people come to the park all year round to stroll with friends, read a book or walk their dog. Facing this square is Embaixada (“Embassy”, Praça do Príncipe Real 26) , a restored palacete (palace) formerly known as Ribeiro da Cunha Palace, a striking 19th-century building with Arabian influences. The inside houses many individual shops, but the restoration was done and the businesses managed in such a way that the original architecture was preserved, with no extra walls constructed. Here you can find a wide variety of products from Portuguese designers, from clothing for women, men and kids to shoes, throw pillows, jewellery, bags, stationery and furniture. There’s also a restaurant, Atalho Real, located in the spectacular two-storey courtyard, and a lovely, light-filled bar, Gin Lovers, where you can sample a variety of cocktails while gazing out through the tall windows at the leafy garden behind. 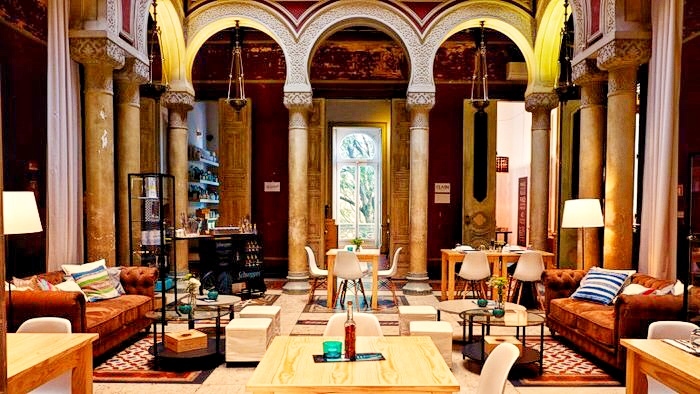 And in fact, as a bonus, immediately next to Embaixada are two other trendy concept stores, where you can further explore the creative work that Portuguese designers have to offer. This shopping tour just touches the surface of the incredible variety of discoveries waiting for you in Lisbon. Along the way, there are sure to be lots of other treasures that catch your eye as well. And of course, now that you’ve arrived in Príncipe Real, you’re right next door to the best Portuguese language school in Lisbon: Portuguese Connection! This is the place to learn Portuguese in Portugal. If you don’t already know, you’ll soon find out: we’re like a family! So stop in and say hello - we’re looking forward to seeing you! Até breve (see you soon)!